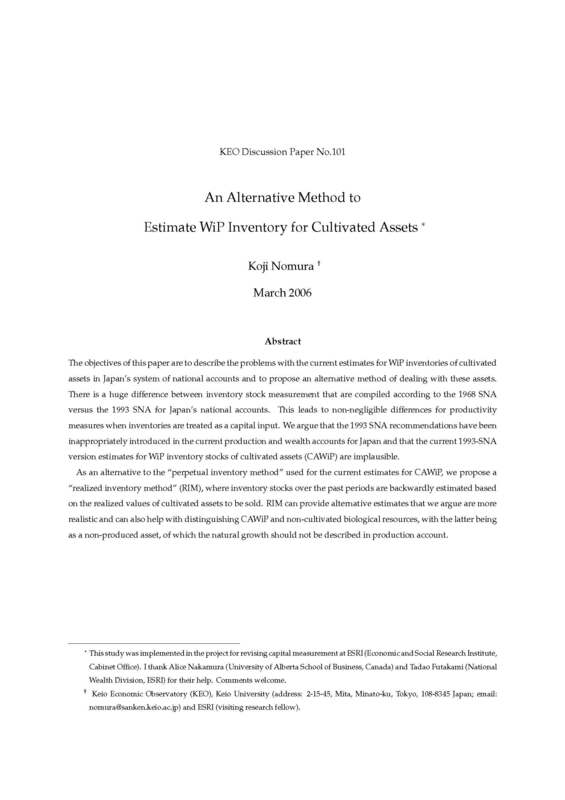 The objectives of this paper are to describe the problems with the current estimates for WiP inventories of cultivated assets in Japan's system of national accounts and to propose an alternative method of dealing with these assets. There is a huge di erence between inventory stock measurement that are compiled according to the 1968 SNA versus the 1993 SNA for Japan's national accounts. This leads to non-negligible di erences for productivity measures when inventories are treated as a capital input. We argue that the 1993 SNA recommendations have been inappropriately introduced in the current production and wealth accounts for Japan and that the current 1993-SNA version estimates for WiP inventory stocks of cultivated assets (CAWiP) are implausible. As an alternative to the "perpetual inventory method" used for the current estimates for CAWiP, we propose a "realized inventory method" (RIM), where inventory stocks over the past periods are backwardly estimated based on the realized values of cultivated assets to be sold. RIM can provide alternative estimates that we argue are more realistic and can also help with distinguishing CAWiP and non-cultivated biological resources, with the latter being as a non-produced asset, of which the natural growth should not be described in production account.